Pop quiz: Given that recent data suggests that women earn 72% of what men do for similar work in Canada, what is the wage gap for women in engineering in Alberta? You're right! The math behind the wage gap depends on what you're looking to achieve in your analysis. Congratulations! Let me explain. For the last couple of years, APEGA has published a detailed salary survey of its members. 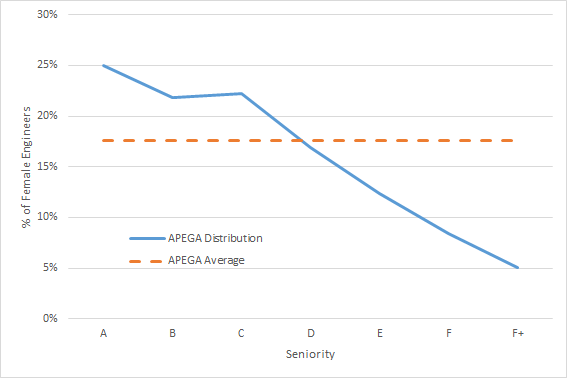 (This year, APEGA instead published an 8-page summary of the survey, and asked $1,900 to share the full information with you, while also withholding the complete data from previous years. Yuck.) 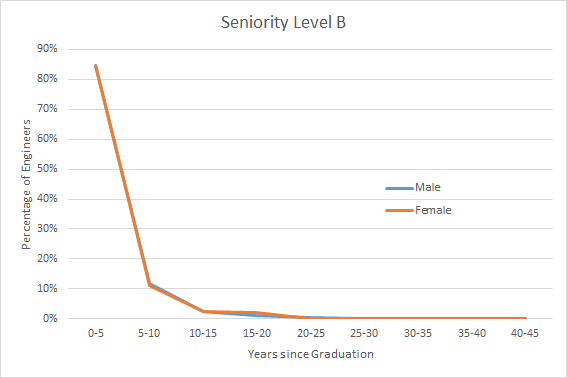 Fortunately, through the power of the web archive, we can access the previous salary survey data, which is helpfully broken down into many demographics. Let's take a look. From the 2014 salary survey, the average male engineer's salary was $125,721, and the average female engineer's salary was $109,402, for a wage gap of 13%. Alright, we're done here. That was easy. For salary survey purposes, an A- class would be the equivalent of a co-op student, and an F+ class would be senior management. 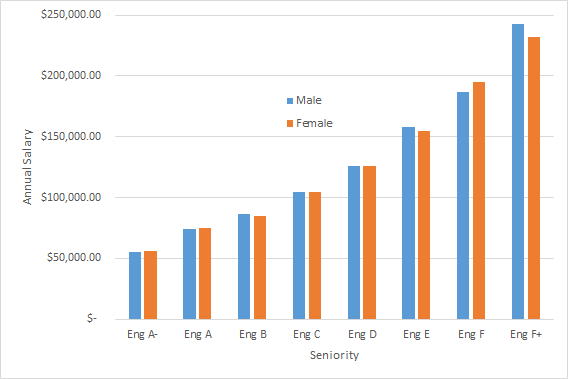 When we look at the data like this, we see that until maybe the very top levels of senior management, male and female engineers make approximately the same salaries (within 2% one way or another). If we weight this based on the total number of engineers in each category, we actually end up with females earning 0.15% more than men on average. Alright now that's something. 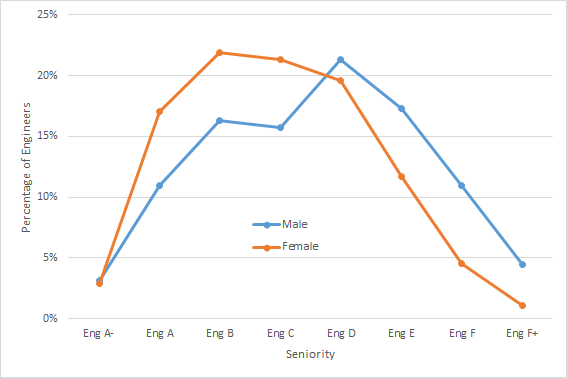 Women tend to average around a B to a C level, whereas men tend to average around a C to a D level. 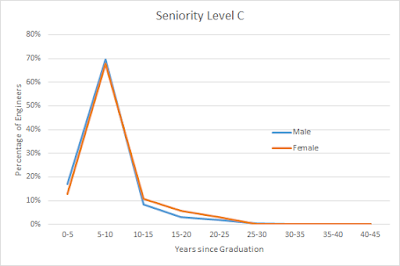 Here's a major difference, and when compared with the salary averages at each seniority level, we can see where the previously-established 13% salary difference comes from. Based on the earlier analysis, I'm pretty optimistic that for the same responsibility level, male and female engineers make approximately the same wages. But it's definitely worth looking into what's causing the differences in distribution of work responsibilities. Starting out, I think there are three major plausible theories. A pessimistic and sexist theory could be that men are promoted faster in the workplace, and as a result tend to sit higher in seniority (glass ceiling style). The disappointing yet potentially less sexist theory is that women, for one reason or another, leave the workplace earlier than men, and as a result there are fewer of them to take on senior management roles. And the last theory is that changes in the graduation rates of female engineers are leaving women just now catching up to men in equality. Alright, they actually all look reasonably similar. If anything, there may be a higher percentage of younger women in D-level positions than men, similar to the higher percentage of very young men in C-level positions than women. Nothing that could quite explain a 13% wage disparity though. Yikes. Please note though that the salary data for people who've worked 35-40 years is pretty slim, so it's not terribly unlikely that there actually are some women engineers in that demographic, and the 2014 salary survey actually over-polled the number of females which may also skew the data. Either way, we see a clear trend where older and more senior engineers are substantially less likely to be female than younger engineers. 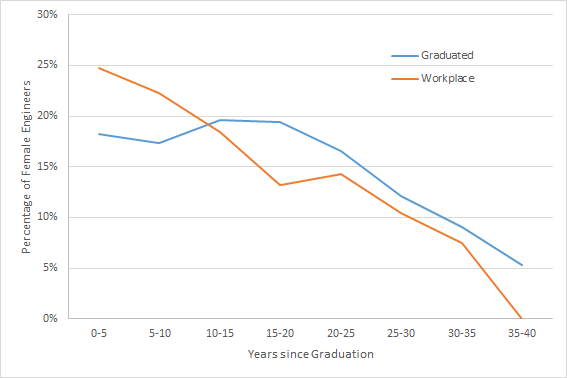 While there may be a bit of a discrepancy between Canada graduation numbers and Alberta employment numbers, I think this comparison is still valid. So what are we left with to explain the wage gap for engineers in Alberta? It appears as though a significant part of it may be due to the fact that, until relatively recently, the rate of women entering engineering education was dreadfully low. A lot of the high-paying senior management positions that are held by men simply don't have many women counterparts to be offered to, leading to an imbalance in seniority. That being said, women in engineering, certainly past the 20-years-since-graduation mark, are still lagging behind their graduation rates, suggesting that women who did graduate over 20 years ago were still more likely to leave the field than their male counterparts. Where does this leave us? Well, while things are definitely getting better, and engineering is surprisingly better than the average of other workplaces, there's always work to be done. 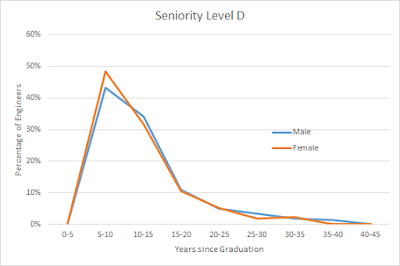 I suspect that as the workforce ages, we'll see a narrowing of the disparity in seniority, and hopefully in the meantime we can figure out which factors lead to women leaving the field disproportionately. Only when we reach a situation where opportunities at all levels of engineering employment are equal will we have a truly equal environment for engineers in Alberta. 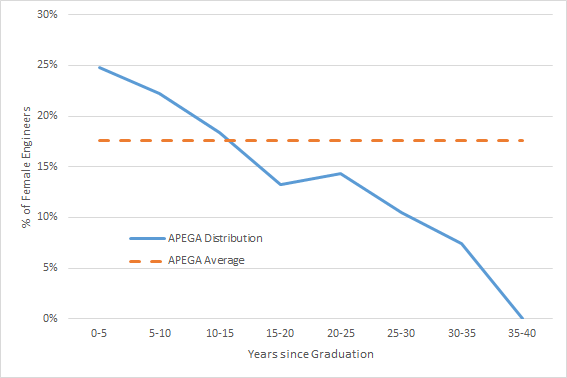 Edit: It's worth noting that the APEGA salary survey does not distinguish between full time and part time, or contract or non-contract work. As a result, any potential gender disparities between these forms of employment haven't been assessed in this post, or in the APEGA salary survey as a source. Which factors lead to women leaving the field? I'd say a big one would be having children. I didn't finish my engineering degree; I went into teaching instead. However, since graduating in 2013 I have had 2 children (the first was born a month after finishing my practicum). So since graduating nearly 3 years ago, I've only worked full time about a year and a half. I would actually prefer to only work part-time to save on childcare and see my kids more. At a networking event hosted by APEGA last October they said that men and women leave the membership at the same rate. But what was new is that they looked closer to the statistics. Men are leaving in their 50/60's and women are leaving in their 30's. Though having children is a factor, i have a feeling there is more to the story. The lack of flexible work arrangements could be part of that story. The options seem to be full time (with the potential of 60 hour work weeks, being on call etc) or not working at all. There seems to be very few options in the middle. In many ways institutions are still setup for a worker with a helper mate at home. This does not work well for duel career families and single parent families. Families may be making hard decisions on who should stay home in order to take care of children or other family members (elderly care etc). That way a family can make one career work in the current setup. There is also a lack of mentorship for women in engineering and the geosciences. I am part of the AWSN (formally known as the Alberta Women's Science Network). We have seen a large amount of grassroots mentorship and networking groups pop up for women over the pst three years. It is quite interesting to attend the events. Sometimes women who attend are the only female professionals at a company. It is great to see them get a chance to peer mentor each other and find senior female mentorship. I feel this this is part of the story as well. Thank you for your graphs. I would love to see if for the geos too! Great blog. I have a site of chemical engineering personal statement which have a surety base work. It help you in all ways. I'm not sure what is my opinion on this topic. Of course equality have brought a lot of positive aspects for woman. But also sometimes women can suffer from great responsibility that they received together with freedom and permissiveness. On the pixelexplore.com we can see that female salaries are equal with male ones, but it's not stated that the majority of that women are single and lonely. Isn't this a high price for equality?